Few bands in metal have been as influential as they are underrated, and near the top of that list is Washington’s Metal Church. Founded initially by guitarist Kurdt Vanderhoof in 1980, the band unleashed its eponymous debut record in 1984. Vocalist Mike Howe would join in time for the band’s third album, 1989’s Blessing in Disguise. While Metal Church has utilized three different vocalists during the bands’ various incarnations over the last 35 years, Howe is most frequently considered to be the group’s signature voice. After recording three albums with the the group between 1988 and 1995, Howe left the shifting music scene altogether. He returned to the Metal Church fold 20 years later, reuniting with Vanderhoof, who claims that Metal Church would likely not have continued without Howe’s re-emergence. The duo, along with longtime bassist Steve Unger and guitarist Rick van Zandt, reappeared in 2016 with one of the band’s strongest albums, XI. The record signaled not simply a rebirth for the band, but an awakening within the metal community that re-energized old fans and brought in countless new fans as well. This month, Metal Church has again unleashed a beast of an album with their twelfth studio effort, Damned If You Do. The album picks up where XI left off, but is a heavier and more powerful affair overall. This week, Metal Nation spoke with Howe about the new record, the impact of new drummer Stet Howland, and we look back at his memories of his debut album with the band, 30 years ago. Tell us about Damned if You Do from your perspective. To my ear it’s a heavier and perhaps more aggressive record. This is Stet Howland’s first record with the band–maybe he had an impact on some of that? How’d you guys come up with the idea for that “Hum” intro for the title track. It’s a crushing song without it, but that just adds this dynamic element to it. It’s like heavy metal yoga. I know there is no lyrical theme or concept for the record, but looking at some of the song titles; “Out of Balance,” “The Black Things,” “Rot Away,” “Revolution Underway”; when you look at what’s going on in this country right now, the world in fact… were there heavy topics weighing on your minds? Not is only is 2019 shaping up to be a big year for you guys, it also marks the 30th anniversary of your debut album with the band, Blessing in Disguise. What are your memories of making that first album? You can check out the full interview with Mike Howe below as he talks more in-depth about some of the songs on Damned If You Do, his songwriting process with Kurdt, and more. 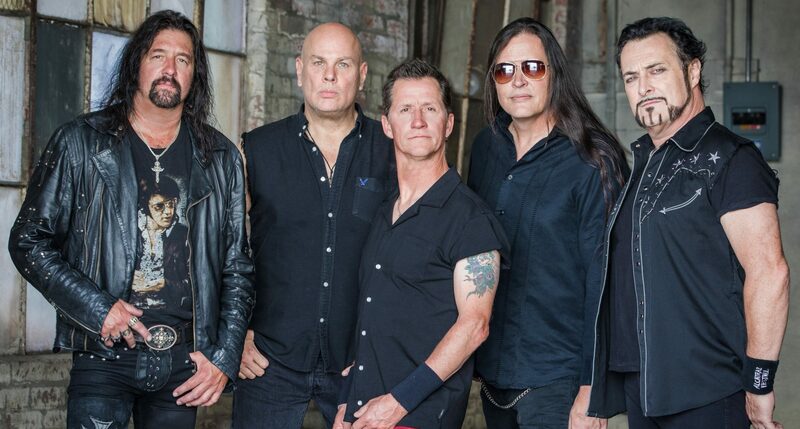 Metal Church is our December Artist of the Month and you can check out that article HERE.